For those of you who I have not had the pleasure to meet personally let me introduce myself: I am Inaki Arana, the Spanish teacher in Aravali. 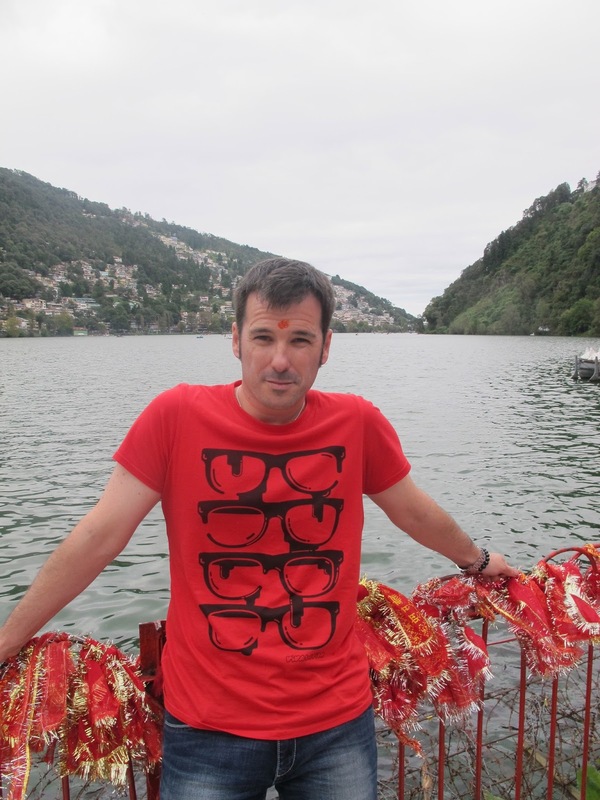 I am from a town called San Sebastian in the north of Spain and I have spent the last 3 years of my life here in India. I came to this country for way far different reasons than teaching Spanish. I was working in the corporate world and my company in Spain sent me to India to be in charge of its manufacturing plant. Yes, all my professional life I have been working in the corporate world: that is what I studied for, I did my internships for, my masters, my trainings…everything. As soon as I reached the age of 18 and I had to decide what I was going to study after high school, there was no doubt that I was going to go for business studies. I was quite oriented or guided (not obliged I must say) by my parents and environment back then, and it was kind of a natural decision, because I come from a family of business men and women. I did not have the required skills for becoming an engineer or an architect, and just the smell of a Hospital used to make me feel (and still does) nauseous. That is how “easy” I took the decision about what I was going to be in the future. I did not do much research and I definitely did not listen to my inner voice that was trying to tell me that I should lead the way in a completely different direction…I wish I knew then what I know now… but I did not, and I think that is the way it should be. That is one of the beauties of life; not knowing exactly what is coming. Very few people are lucky enough to know what they want to be or become in life at the age of eighteen. So Form 12 students, you are not alone on this one! My first working years were great. I was always learning new things and I was enjoying the fact that I was being able to earn my living. I am a curious person by nature so I had a lot of stimuli to focus on. I always enjoyed languages and I loved travelling (I still do), so I specialized in International commerce. I soon started to work in Export Departments of different corporates. That allowed me to travel and to visit all the countries that I dreamt of when I was a little boy. I jumped from company to company during 13 years, in periods of 3 years at each place. That was the time limit that I was allowing myself to learn new things, so I had to change and move on to bigger challenges; always within the corporate world but in different assignments. I have to say that during all these years I was doing a great job. I was taught early on, like in many households all over the word, that “whatever you do, do it right and be the best at it!” And I followed and still follow that. But deep in my heart I knew that I was supposed to do something else with my professional life (this inner voice I mentioned before never stopped sending messages to me); something that I knew but I was not daring to say out loud or even admit to myself. Changing companies (I can say it know with some perspective) was just an excuse or what I call a red flag, it was me saying deep inside:”I do not want to continue in the corporate world. It does not give me any satisfaction and what I really want to do is teach”. I wanted to do something that was closer to my heart, to my personality, to my real abilities…something that was more connected to me where I could give my 100% every day. The last company I joined brought me to India. The project sounded amazing when I first heard about it. They needed a person who would be in charge of a whole manufacturing plant (more than 200 souls). I was going to live abroad, I was going to become an expat!! It was what any business student would write down in his/her letter to Santa! So even if I still had doubts in my mind, I immediately accepted the challenge and joined. The good news was, and I am being ironic, that the company was located in the middle of India (in Indore). I did not know what I was up to. Being alone in a foreign country gives you a lot of thinking time. There is barely any space for leisure, all you do is work, but you have a lot of thoughts coming in to your mind (late at night) that make you question everything that you are doing in life. I had a lot of thoughts coming to me indeed. Everything that I had felt about my professional life and all the doubts I had about me doing the correct thing suddenly increased in intensity and really made me think seriously about my future. My company, after working in Indore for 1 year, decided that the plant was well under control and transferred me to their second manufacturing plant in the South. In Chennai. Well, when I say Chennai what I mean is an industrial hub that is an hour and a half away from Chennai City. Once again, a great place for your own thinking time. I had to adjust and adapt again to a different environment, different weather, food, people…everything!. And trust me, it is a hard task. It was not an easy one…in theory I had everything that anyone in my position and with my background could have and desire. But there was something missing that was not allowing me be “happy”. On the other hand, I have to admit that I was in a position where I could afford and allow myself quitting my job. It does not happen always that way. I came to Delhi (Gurgaon); I thought that being in the capital of the country would allow me do better than in the cities that I had lived before. I had no doubts that I wanted to remain in India and do not go back to Spain. I had the feeling that if the transformation had started in India it should continue here itself. Plus, I love the country and I still wanted to discover the many wonders that it has to offer me. I happened to find a place in Gurgaon, just in front of the School and I decided to come by and introduce myself. The rest of the story, you already know. I hope this personal experience will allow you to get to know me and my intentions better. What I have learnt in all this process is that we have to follow and do what it is closest to our hearts, what we believe we are good at (whatever it is), and give our best and all in that; no matter what other people or family think (we need their blessings but approval is not necessary). It is our own life that we are talking about and we have to be accountable for it. None of what I have explained comes with being at home, laying down on the sofa complaining about how unlucky we are or how things do not work the way we expected to. It requires high working ethics, pursuit of excellence (both in our personal and professional life) and a truly conscious belief in oneself and one self’s possibilities. I could not have done all this without all my background education, experiences and learnings. I was provided the best education and possibilities and after many years, I believe I have taken advantage of all of them to do what I am doing right now. Trying, keep trying, taking risks and learning form “failures” are great concepts; they are necessary learning processes where the best creative you is reborn and finds alternative ways to carry on. Always keep curious about everything that surrounds you, you never know what futures holds for you. The Shri Ram schools provides all of us great opportunities to keep our curiosity alive, students are exposed to so much stimuli in so many fields (both academic and non-academic) that definitely provides them the best tools to be able to take decisions that will determine their future. Let’s be ready to explore and enjoy the journey!